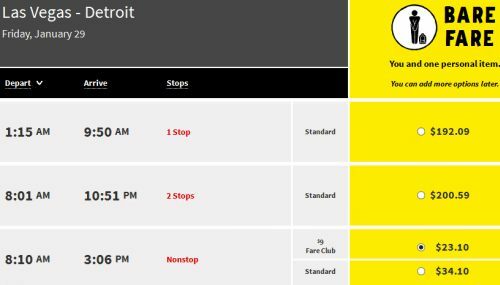 Spirit Airlines is showing airfares from Detroit to Las Vegas for $98 CAD roundtrip including taxes. Detroit is about a 2 hour drive from London, Ontario. 2. Search for a flight from Detroit to Las Vegas. 3. Look for the flights that are $34 USD each way. $68 USD roundtrip should work out to $97 CAD when booked with a Canadian credit card at today's exchange rate. 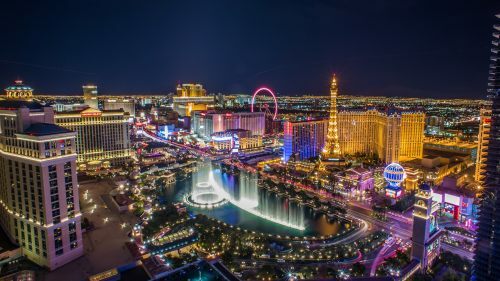 flight deals, detroit, dtw, las vegas, nevada, united states, spirit airlines and north america. One Response to "Detroit to Las Vegas - $98 CAD roundtrip including taxes"
I bought a flight for my mom with Spirit before Detroit-Las Vegas. It is a very cheap affordable option, but keep in mind they do charge for a carry on, and if you buy it online vs. at check in, the price also varies. Print your boarding pass at home or they charge you $10 to have it given to you at the airport. All in all, it is still very cheap, but be wary of their charges for absolutely everything, including water on the actual flight. Go prepared!! !